Unbleached Mulberry Paper is a versatile off-white paper used for many art applications like Shoji Screens, Sumi-e and Block Printing. 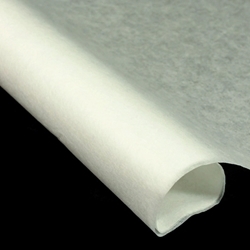 This paper's weight makes it highly translucent and has been smoothed for printing and painting applications. This fine printmaking paper is a staple for any artist’s paper collection. The Unbleached Mulberry Paper is made in Thailand from 100% kozo (mulberry) fibers making the paper very strong and durable yet lightweight and flexible. Smooth on one side and slightly textured on the other, the unbleached mulberry paper has no sizing. Use this fine paper for block printing, fish rubbings, silkscreen and origami. Available in three sizes: 8.5" x 11", 12" x 12" and 25" x 37"